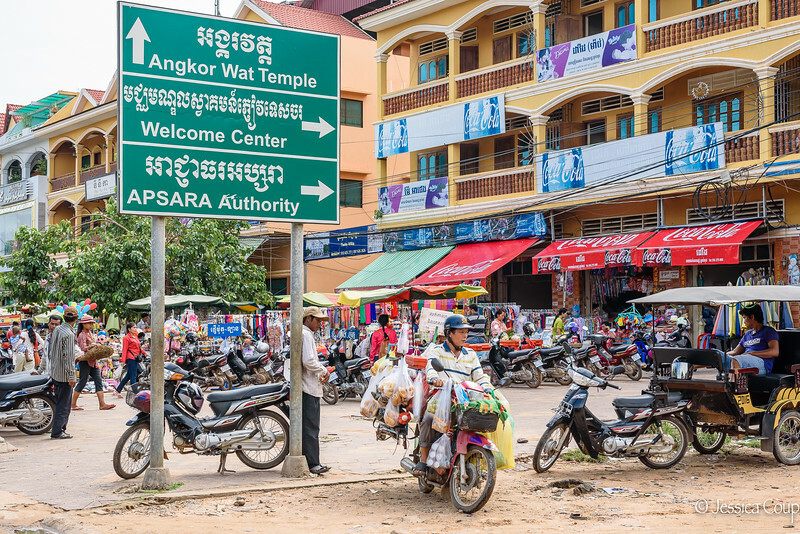 As I figure it, you can visit the temples of Angkor Wat in Siem Reap one of two ways: you can go all Laura Croft and rush in to see as many temples as possible in quick succession and in a day or two have temple fatigue and move on to the capital city of Phnom Penh. Or you can stop and soak in the energy, spirituality and culture of Siem Reap. We woke up at 4:15 am to catch the sun rising over a very rainy Angkor Wat and continued the day with a wonderful guide, Sip, who explained the history and ancient culture of the Khmer Empire along with the current economic and political views of today. Sip also tried to encourage me to get over my fear of climbing very steep, high steps without a railing. You really do need some Laura Croft moves to maneuver around some of these very tall temples. We also spent time, thanks to our friends at Bodhi Tree Retreat and Yoga Center, touring around the countryside on the back of motorbikes meeting locals, eating food from the market and straight from the field and visiting temples outside of town. I am now a huge fan of lotus seeds and, of course, a fan of the beautiful children we met along the way. Over 95 percent of Cambodian people are Buddhist, and we received a very enlightening education on Buddhism in Cambodia thanks to spending the afternoon with Tho Sokhum, a monk who guided us through temples, the education system, philosphy and a very wet water blessing. Thanks to spending time with locals including our wonderful Tuk Tuk drivers who would slow down so I could capture the amazing scenes and landscape, we have a great appreciation for Siem Reap. Keep in mind that Siem Reap is not just a place to see gigantic temples and to check another UNESCO site off a list. It is a spiritual destination, made the more so by its people. The Cambodians are genuine, kind people who are working to survive each day, smiling all the while.